You know Niagra of Bangladesh Nafakhum Bandorban waterfall? Nafa-khum is the largest waterfall by the volume of water falling in Bangladesh on the Sangu river. 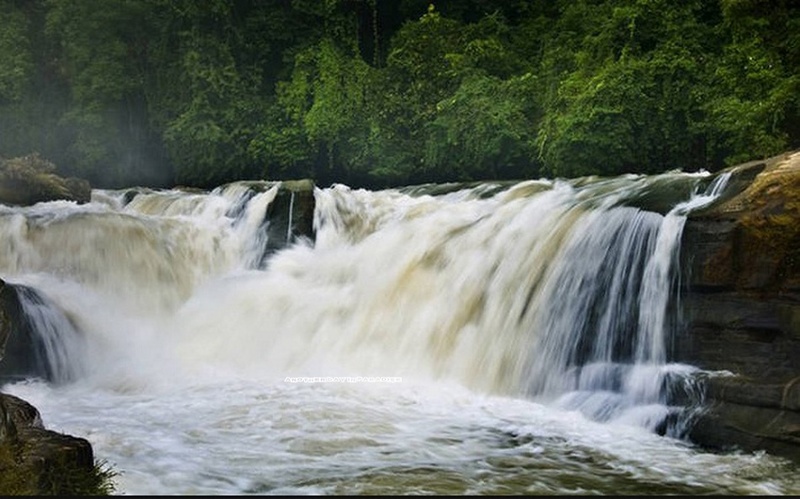 ‘Khum’ is a word of ‘Marma Language’ which means ‘waterfall’. This is really a beautiful place for travelling with friends and Family. You will feel the touch of cold water of the hilly nature of this country. Most wanted tourist spot of Bangladesh where if you go just for once, you will desire to travel this again and again until you live in this world. So you may decide to take a short trip towards ‘Nafakhum Waterfall’ to go out from the jumble of this modern life. 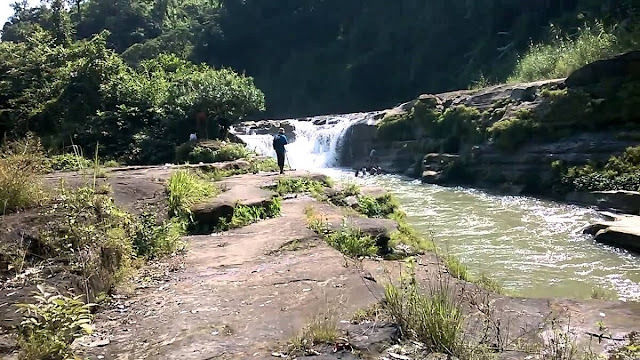 This waterfall is located on the wild hilly Sangu river which is in a remote of about three hours’ walking distance from Remakri of Thanchi upozilla under Bandarban district. Remakri is located about three hours’ journey by boat on the Sangu river from Tindu which is located about three hours’ journey by boat from Thanchi. To go to nafakhum waterfall, travellers must have to come Bandarban at first. For this task, there are a lot of buses in Bangladesh to travel to Bandarban. You may also use your private car or other transports system as your wish. If you travel from Dhaka to Bandarban then the following information will be helpful for you.If you choose to travel by bus, you may use S.Alam or Saudia.Then it will take about 550/- tk. It will take you to Thanchi Upazila.This bus usually start from 10:30 pm. It take about 7-8 hours to reach. After reaching Bandarban,you have to go Thanchi. Thanchi is about 79 km from Bandarban. It will take about 4.5 hours to reach Thanchi from Bandarban. Travellers may choose to have a tour guide.There is a tour guide committee which supply a guide to travel and the guide will stay with you about 2 days and will help you to visit all spots.Guide will take charge 600/= for first day and for other days 500/= per day ( excluding his food and accommodation ). You may choose a boat for an exciting journey by boat from Thanchi to Remakri. You must need to hire engine boat because there is no other types boat. It will take about 4 hours to reach Remakri. Cost for boat is about 4000-5000/= tk for up-down. Never forget to visit ‘Boro Pathor ’ in Sangu river but be careful because it is extremely dangerous. Take lunch at Remakri. There are some good restaurants at Remakri. Single lunch cost may take around 120 tk. You have to stay at Remakri at night for next day visiting. Guide will help you to find out the best place. There are Tribal houses. Cost is about 70/= per traveller and dinner cost is about 80/= taka per meal. You will find beef, egg and fish as menu items. You may also take the help of guide to find best items. In the next day, you have to go very early about at 5.0am. You have to walk about 2-2.5 hours to reach Nafakhum from thanchi. There is no transport except walking. You may stay about 2-3 hours at Nafakhum to enjoy the great natural beauties. Really an amazing place to enjoy. To return back Dhaka from Nafakhum, first you have to return from Nafakhum to Remakri. You have to travel from Nafakhum to Remakri between 10:00am to 12:30pm. Coming back to Remakri, you may enjoy another waterfall called ‘Remakri khum’. Then ready to back to thanchi from remakri. This journey will start about 2:30pm and you will reach at Thanchi about 2 hours later at 4-4:30pm. In this case you have to use boat to journey. At thanchi, you have to stay because there is no bus to return back Bandarban after 2:30pm. In the next day,in the morning you have to start your journey about 7.00am first bus.It will take about 4-4:30 hours to reach. After arriving in Bandarban you may decide to come Dhaka directly. But for this purpose you need to wait till night for buses. Otherwise,you need to come Chittagong and this will take 2-2:30 hours.In chittagong,there are a AC and Non AC buses are available and you can easily come back to Dhaka.